We are always happy to hear from the dedicated band of gardeners who love using our products. 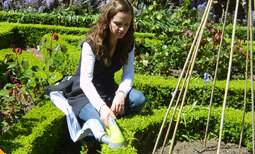 Over the years several useful tips have been raised by you, which help other gardeners use their Garden Groom. If you have any points or tips which you think will help others enjoy their Garden Groom, please email us here. You will be credited with the suggestion if it makes it to our site. 1. Always inspect the area for foreign objects (i.e. metal, concrete, posts, etc.) before trimming. 3. To trim long stalks growing parallel with the surface of the hedge, move the head down in the opposite direction to the growth. 4. When trimming the side of the hedge, we recommend a pendulum or vertical sweeping action, ensuring the flat underside of the machine is level with the surface of the hedge. 5. For a tighter professional finish, bury the head of the machine into the hedge to the desired depth, working the machine upwards. 6. The Garden Groom is self-supporting and as you layer down, it will find last years growth. 7. Regularity of cut - After using the Garden Groom and arriving at your preferred hedge length, we strongly recommend you use your Garden Groom 2/3 times per year, as regular use will ensure a better, tighter finish. 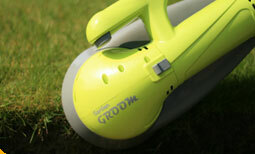 The more often you use your Garden Groom, the quicker the task will become. 9. Attaching the container - When fitting the extension tube, ensure the ridge on the edge of the exhaust hole is covered. 10. Container and Volume Bag - it is essential that all waste is emptied out, as if left, it will decay inside the bag. 11. Do not overfill the container or collection bag as this will effect the performance of the machine. 12. On board container is easy to clean with a garden hose. 13. Never put hands or other body parts in or around the blade area. 14. If you need to inspect the blade area, always wait for the blades to stop completely and then deactivate and unplug the tool. 15. Never cut at eye level. 17. Always wear eye protection. 19. Do not use in the rain or on wet or damp growth. 20. Never tape the switches. 21. Never use without the container or volume bag attached. 22. Always clean after use. 23. For best results for each machine’s trimming application – Refer to the Instruction manual. 2. The Garden Grooms flat footprint ensures a level professional cut. 3. Awkward areas such as floors, walls and railings, which are difficult to reach with a conventional trimmer, are easier to reach with the Garden Groom. 4. The Garden Groom is low maintenance compared to a conventional trimmer. A wipe down with a damp cloth is all that's required, compared to sharpening and lubricating with oil. 5. Because of the Midis versatility, manoeuvrability and blade design, it enables shaping of most hedges and ornamental bushes. With a conventional trimmer, there is always a risk when shaping of damaging the bush. 6. The Garden Grooms shredding of spiky material makes disposal far easier, as the user does not need to handle the waste. 7. Because the Garden Groom collects, it is ideal for trimming over flower beds and pool areas.